Ninety-Nine! | Sew Lindsay, Sew! Guess what? This is my 99th blog post, with my 100th just around the corner! It’s taken me a pretty long time to get here, considering my first post was on October 19, 2010. But my last-minute decision to go to grad school in 2011 meant my blog took a really, really long break and I’ve recently hopped back on the sewing train. Celebrate! In my next post, I’m going to announce a cool new idea I have up my sleeve in honor of the 100th post. But for number ninety-nine, I thought it would be fun to dig into the archives and highlight some of my previous projects – including some that were never even mentioned in my blog. This is just as exciting as getting the DVD and watching the extra scenes that were cut out of the movie, right!? I never showed this project in my blog, but the reason I want to highlight this really-needs-to-be-pressed-and-topstitched bag is because it was my first project ever (not sure if you caught that in my creative title). I use the term “project” loosely as this was really more of an experiment than a project. I made this using hand-me-down fabrics as a way to test the features on my brand new sewing machine. I used free project instructions from the JoAnn web site (and quickly learned the project instructions on JoAnn’s web site are pretty terrible and I’m much better off going with tutorials written by bloggers). This bag is lame. I even sort of knew that at the time that I made it. But I knew I’d always want to keep it so I could look at it in the future and see how far I’ve come. Well kids, today is that day. Look how far I’ve come! Sometimes it’s fun to look at the metrics for my blog and see which posts were the most popular (or unpopular) and the Google search terms responsible for leading readers to my blog. The most popular post of all time is about the quest to sew a cover for my nook (aka, Barnes & Noble e-reader). I have one of the first versions of the nook, so it’s funny to me that this post is still so popular. I’m guessing the size of e-readers has changed about a hundred times in the past few years so I’m not sure how relevant this particular post/pattern is these days, yet readers are still regularly visiting this post. I really loved this pattern (purchased from etsy) and still use and adore this case! One reason (of many) I started sewing was because I had so many ideas for projects inspired by Disney. 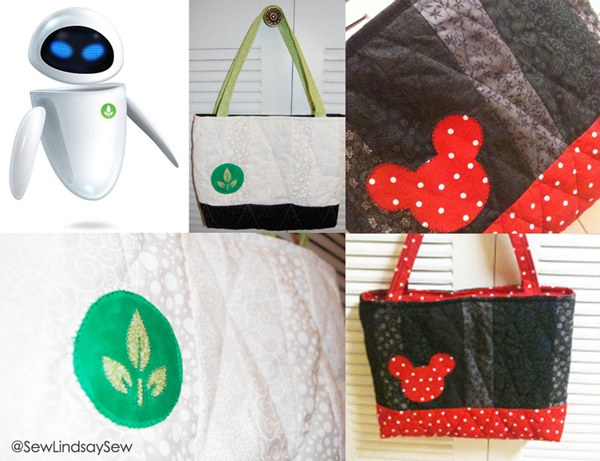 Some of the first projects I made were these modified Friendship Bags as gifts for friends – one was inspired by Eve of the movie Wall-E, and another was inspired by Minnie Mouse. I really loved these finished bags and considered them my “favorite projects ever” for a really long time. I do still love them, but if I made them nowadays I’d make the handles sturdier and add some additional “wow” factors, like interior zipper pockets. The tutorial for this bag, though, is pretty important to me because it’s the first project I successfully completed that was actually good enough to gift to another human being (aka – not The First Project Ever listed above which sits at the bottom of my fabric bin). For my first “real” project, I had struggled with a Simplicity purse pattern for a long time before I finally gave up. I then found this Friendship bag tutorial on p.s. i quilt and the rest is history. 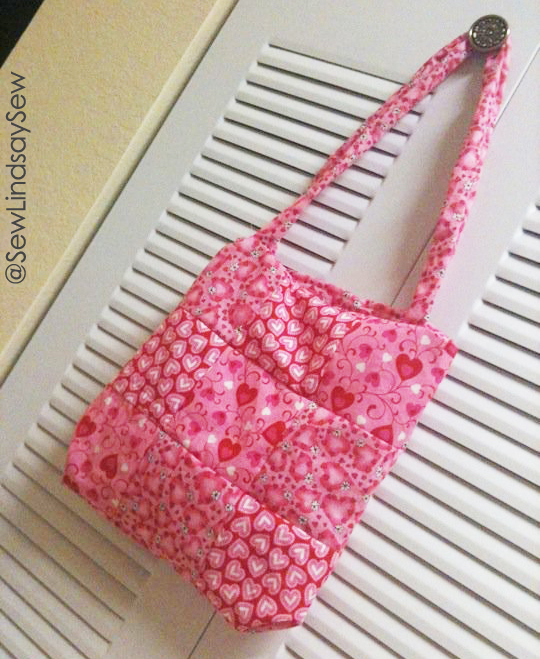 This bag really taught me the basics behind sewing a bag with boxed corners, handles and lining, all skills I have revisited time and time again throughout my sewing journey! I really love bunting. Bunting (or pennants, banners, garland, whatever you want to call it) is pretty trendy in the crafting and design world right now. But I’ve always had a thing for interchangeable, seasonal decor, which is why I love it so much. Plus, although it can be a little time consuming and repetitive, it’s really easy to make. This year, I’ve made three types of bunting: candy corn, marshmallow bunny Peeps and summertime watermelon. My poor little candy corn never got highlighted on the blog, so you get to see it right now instead! 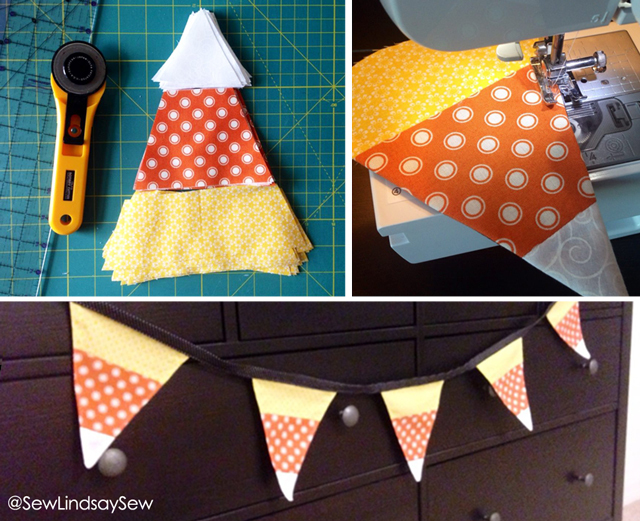 Each time I make bunting, I actually make two sets – one for home and one for work. That means I have six sets of bunting behind me, even though I only have three designs to show for it. Hence the “repetitive” callout in the title. This project is hilarious because… it just is. First of all, it’s a giant monster costume. Second, I’ve since Photoshopped over the face of the dude in the photo with a picture of Nick Lachey. Which just makes it that much funnier. 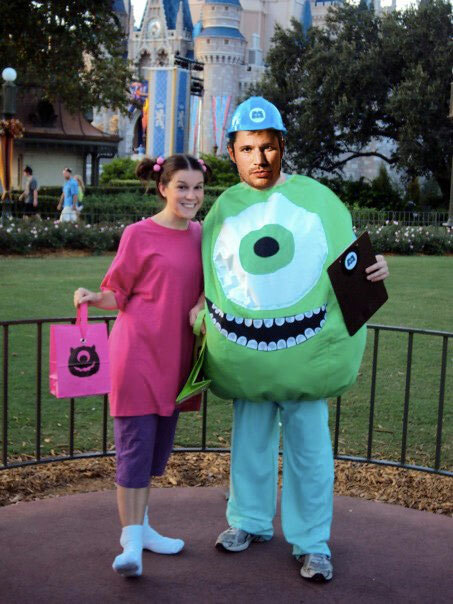 Can you believe I was lucky enough to go to the party with Nick Lachey? This costume, although embarrassing, is notable because it’s the first “big” project I completed. Technically, it’s the first “wearable” project I completed (LOL – obviously I use the term “wearable” loosely) and it’s the first project I completed using a real pattern versus an online tutorial. It still hangs in my closet and is a really funny costume piece to pull out when I want to run around the house and scare the dog. When reflecting on this one, something I wish I would have done differently is switched up the lining. The pattern called for something thick and heavy – I don’t remember exactly what, since I had no idea what I was doing in those days – but the costume is really HOT! Especially here in Central Florida. Nowadays, I’d look for something durable enough to hold the shape without holding in so much heat. Okay, enough reminiscing for today. Next up is my milestone blog post — stay tuned for a project idea inspired by the number 100! « The force is strong with this one! 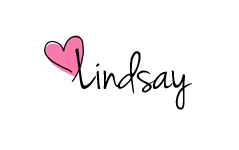 Hi Lindsey, I follow your blog and enjoy your posts! I’d like to invite you to join a blog hop I’m a part of – would you mind emailing me at madebyjaime at gmail dot com. I couldn’t find your email address on the site. Thanks! Look forward to chatting!